With global warming and the resulting climate changes, flooding is increasingly becoming a problem. Often the ordinary householder thinks there is nothing they can do to protect their property - but now there is ! This page will help you gain a better understanding on how floods can damage your property and how products can help you in the event of a flood in your area. Has your basement been adequately tanked? If not, what is the porosity of the ground? Do you have cracked or damaged drains? There are many, many more factors that can also take effect. This is the same as with basements, with the exception that the area beneath the floor is unlikely to have been tanked. A sump situated roughly at the centre of the house could be used in conjunction with a pump to remove any collected water. It would, however, not be advisable to set the sump too deep as penetration through the water table could occur and this would not be good in the long term. If you do decide to install a sump, as with many building projects, it is recommended that you use a professional to complete the work. Over the years, ground levels around external walls tend to rise. Maybe a patio or pathway has been built higher than the recommended 6 inches below damp proof course level? Whatever the reason, you may find yourself with a potential water entry point. If the Antiflood Barrier has been fitted, air bricks will usually be protected. There are, however, other factors that need to be considered: If rainwater or run-off were to collect inside the barrier, can it be pumped out quickly enough in relationship to the height of the air brick? If in doubt, consider using a device designed specifically for this purpose. Drains are a major problem during a flood as they cannot cope and will therefore fail to work. Here follows a brief outline of protection systems that you can install yourself. 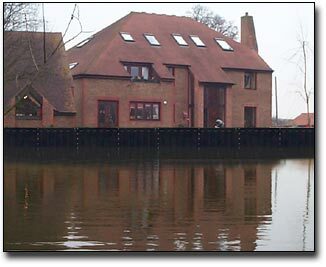 If you have installed the Antiflood Barrier, water from the outside will be greatly reduced if not stopped completely. The next step is to tackle the drains in order of priority. The lower the drain in relation to the floor level the greater the need for action. These levels will always be affected in relationship to the flood level and will change inside the barrier only if and when water is discharged via the WC, bath, basin, sink rainwater. It is usually possible to put a plug in the manhole to stop backfeed from mains sewers etc. You can also use the manhole as a collection sump inside the barrier It is advisable to employ a redundancy brace to ensure the plug stays firmly located in the drain. This ensures that if the bung is not located correctly or tightened sufficiently, it will not be forced out by backfeed pressure. A simple piece of 6" x 2" laid in the channel will usually suffice. If your gullies are connected to the main drainage or tank, as the flood advances the water will come out of the gullies in relationship to the flood level. Therefore all gullies need to be sealed, although this may not be necessary if you have plugged the main drain as above. There is a range of automatic backfeed gullies but they can fail & make the whole barrier system pointless. Some products are manufactured to deal with this problem. If you cannot use the manhole as a collection sump, a series of sumps will need to be fitted inside of the barrier in order to dispose of seepage and rainwater should the need arise. These sumps can be fitted with automatic pumps to discharge water and a manual pump can be supplied should the electrical supply fail. If you have a bath situated on the ground floor then that would be the next affected point of entry. Logically, the lower the discharge point, the lower the seepage. Some products will seal most drains, including showers and washing machines. Once again this will not be necessary if the manhole is plugged. Next the ground floor WC. The same advice as "Bath" applies. Washing machine stand pipes, basins, sinks and so on. Air vents should not be an issue if the barrier system is fitted, however there are some products which can be installed where it is impractical to erect the barrier. There is always the possibility of ground seepage. The severity of this seepage is not calculable as the volume of water seepage is governed by a great many factors. It is possible to slow down the seepage but first you have to know where it will occur and why. If your premises are of a modern construction, it is most likely that after the foundation brickwork had been built, the builders filled the void around the brickwork with all kinds of rubbish. This is a potential problem as this filled void is very seldom compacted and, as such allows the water access to a greater height in relation to the ground level, than that of compacted ground. The answer is to cover the area around the edge of the property with paving properly sealed to the walls. In some cases you may well want planting areas. These should be excavated down to the foundation slab and filled with compacted earth. Garden soakaways are usually constructed away from the property and should be well outside the barrier. However, these soakaways are of numerous designs and can give easy access to the inside of the barrier via the drain outlet. If the property is on a soakaway ensure the drain is plugged within the barrier. Modern drains are back filled with shingle or similar. This is also a potential entry point for water. Regardless of how much seepage you get, there is usually a pump that can cope with it. Now you can do something to stop your home flooding and inevitably ruining your furniture - and possibly your life!